A online store called Figures and Toys is listed several new case assorments. However, none of these are confirmed and one appears to be already out of date since the Obi Wan Jedi Armor figure has been cancelled. Here are some great loose shots of the upcoming palmtalkers. In case you have not stopped in or did not know about Vintageman, stop in and take a look at his list of Loose MINT Vintage Figures that are complete with weapons. Richard has updated his section with a carded list of figures for sale. Stop in and check it out. This isn’t figure related but interesting for any PC game fans. Today, LucasArts announced a new SW PC game called SW: Battleground, which will be a Real Time Strategy (RTS) game. It is being created by the same company that created Age of Empires for Microsoft. Read all about it over at LucasArts. We just secured some older cases of the 84105 000 A Episode 1 (the one with TC 14 and R2B1) from Hasbro….They will leave Hasbro’s Washington warehouse this Thursday, and arrive at our warehouse about a week later (3/8) to start shipping to customers. Meanwhile, back in the real world. Etoys announced on Monday they are not able to find a buyer and cannot climb out of debt. They will be shutting down their Website and will file for bankruptcy protection. If you are interested in reading more Raving Toy Maniac has a good article on it. Here is the latest form the guys over at http://www.collectstarwars.com on the subject of Amidala and her missing undergarments… “The Queen is wearing “flesh” colored tights or hose and is not lacking in propriety. If you match the skin tone of her hand to that of her legs, you’ll notice that her legs are darker in color because she is wearing undergarments. This is the FINAL VERSION and is NOT planned on being corrected according to Hasbro”. Thanks for digging up the news guys. At the 2001 toyfair we were allowed to paw over each figure extensively and that is how we discovered Ketwol’s secret feature. In that examination of each figure, we also noticed that Hasbro tastefully provided Queen Amidala (Theed) with appropriate undergarments as befits her royal status. However this picture sent in by a reader shows that the factories where the figures are produced are not as concerned about her majesty’s modesty. Variation hunters… look out! I just wonder how they’ll list this variation in the price guides. Here are the totals to date of our poll. I will say the biggest surprise of this so far is that Darth Maul has received any votes. I figured that figure would come in at maybe 2 or 3 votes. Still have a few days left, take a second and vote if you haven’t already. The guys over at Collect Star Wars are reporting that you can ONLY Pre-Order this Playset in mid March through thehttp://store.wizards.com/jawa web site. NO phone Pre-orders will be accepted during this time. Expect this playset to ship in mid to late Spring 2001. At that time you will be able to place phone orders. Thanks for the news guys. I have been getting tons of emails for this new section and have got 98% up so far. The few not up either had no city or store in the email or was a double report. If I post something about a certain city and store once I won’t post it again, just to save space and some time of my own. Please don’t take it personal, but I am running this pretty much myself and will cut corners if I think they need to be cut. I hope this new section is helping all that weren’t getting the goods in their area. Enjoy guys and definetly give us some feedback on what you think so far. Acpin has completed a new diorama titled ‘Otoh Gunga Found’ where Jar Jar leads the two Jedi knights to the secret city. Check it out as always at acpin.homestead.com/home.html. USAToday.com has a pretty good Q&A with George Lucas. Click on the link to read it. Thanks to J Wilkins for the news. Well if you were using the Deluxe Star Wars Checks and were planning on Reordering, you better hurry. These are being cancelled. Or if you just want to get a set to keep as collectors items. Get your order in now. Laser sent in a scan of what looks like an error on the new Aurra Sing – part of the figure’s belt is unpainted. To check out the scan, go to this page and click the appropriate link. There appears to be a variation on the 300th Boba Fett – one version has a yellow stripe under the viewfinder while the other does not. My best guess would be that it’s the newer version that does have the paint. For pictures and more information, head over to www.islack.com/fett. Thanks to iSlack for the news! Check out this picture send in by one of our yak readers of the transition Darth Vader (Dagobah) packaging. It’s shown sporting a sticker revealing that it’s not just another Darth Vader in the package. The newest releases are reported to have the face plate set aside in the bubble. Variation hunters look out! Rebelscum has posted a Canadian box of the new packaging that we will be seeing. While the box here in the US has the white side (left side) it will be replaced with the more colorful green side. This has been confirmed with Hasbro, so be on the lookout for the new design soon. Now up at http://www.starwars.com is the lastest Ep2 select image I think it is a great shot! If you have been following the story lines you will know who is in the image. This may be a spoiler…..
Insider falling to the light side? Did anyone notice that the latest issue of the Star Wars Insider (#52) is 10 pages lighter than the last issue? That not being bad enough, it’s also physically smaller (no longer the standard 8.5″ x 11″.) At first I thought the number of pages might be due to a missing Jawa Trader, but NO… it had 20 pages of ads when issue #51 had only 18 and issue #51(at the risk of repeating myself) was 10 pages longer! Wizards of the Coast promised each of us a free issue for the long over due #51. Too many more issues like this and they’d better make it two. It could be a transitory condition, however, so I’d like to hear your opinions. Update: I didn’t even notice the price jump to $5.99 either!!! Philip Ayres wrote in with one of the best deals I’ve seen in months. TheToyShop.com, a UK based site who have offered POTJ recently to the UK as well as things like the Eopie and Ammo Wagon in the past, are selling Darth Maul and Anakin, each in the “bonus Pit Droid” two-packs. These things are very hard to find, personally I’ve seen very few of them. Better yet, they’re priced at just £6, which is about $9. You’ll be lucky to ever find them cheaper again. They do ship overseas. Head over now and search for Pit Droid to find them. Anakin and Maul are still in stock, Obi-Wan is up there but out of stock. You can request to be e-mailed when an item comes back into stock by clicking the backorder button. STAR WARS®: BATTLE FOR NABOO™ FOR PC HAS GONE GOLD; DEMO WILL BE AVAILABLE FOR DOWNLOAD ON FRIDAY, FEBRUARY 23, 2001; GAME EXPECTED IN STORES BY MARCH 13. Just spoke with Dustin over at Rebelscum, seems as though there were some lines cut and the page is down for a little while. Please bear with them as they get themselves back up. As soon as we know when they will be up we will let you know. They apologize for the problems and are working to get the page up and running. ** UPDATE Rebelscum is back online! The cool looking SW Starfighter for PS2 has hit the streets today. I think most of the major chains should have it in stock. The price range is from $49.99-$59.99 so shop around or maybe get yourself a price match. Remember clean up your room before any video game playing…. Yakface.com is glad to bring you the collectors something that you have been requesting. Everyday we here at the Realm average up to 20 store report findings a day. So we have made a section on the page dedicated to it. It is very simple to follow. There is now a section link under features that will bring you to the main page. There you will find the 48 continental states. Go to your state and find the latest. We will add out of the country areas as well as we get info on them. I have not received any from Alaska and Hawaii so I did not make a page for them, however if you are out there let us know. When submitting a find to us, be clear on what you found (include price if you can, what city and state you are in and what store you found it at. There are already some findings listed. Also please keep it to new stuff and great deals. Thanks and we hope that you enjoy it. UPDATE: Hey guys Sidi chiming here for a quick sec… I am gonna try to run this section as much as I can so you can also send any store reports to me direct. Enjoy guys we hope this helps many out there that turn up fruitless searches on many occasions. The Aurra Sing wave is now showing up at Targets across the country. Thanks to everyone who wrote in about it. Sandtroopers.com have posted some cool Aurra Sing photos, plus one which shows just how tiny the new Bespin Princess Leia figure really is. Stop by for a look! Toymaniacs currently has the Amidala (Theed), Aurra Sing and Plo Koon waves in stock. John has just about 50 of the awesome and limited Gammorean Guard statues from Legends in 3D. See the clincher is he is blowing them out at an unheard of $59.99…. Yes you read right. These originally sold for $200, but John was able to get the remaining stock on these and offer them for a steal. I would hop over quick and grab one while you can or give them a call at 1-800-505-TOYS. They also have some cool replica props you can check out too. Sandtroopers.com are giving away the yet to be released Carbon Freeze Chamber. This set is slated to be a FC exc, but we have been hearing that for a loooong time now. So get over to Sandtroopers and get it free, or try to anyway. This is well worth it guys. Good luck and thanks to Pat and crew for a chance at this awesome set. I’ve posted ten shots from the showroom this evening – if you’re interested, check out FBTB. Bob writes in to let us know that issue 52 has shown up in his mailbox today. So if you are still a member, then look for your soon. If you want to order or have any questions, e-mail him here! is now in stock. All backorders will be filled immediately. We reserve the right to limit quantities ordered. Only atEntertainment Earth. WompRat sent in this scan of the Android Hunter figure he got from Toy Syndicate. 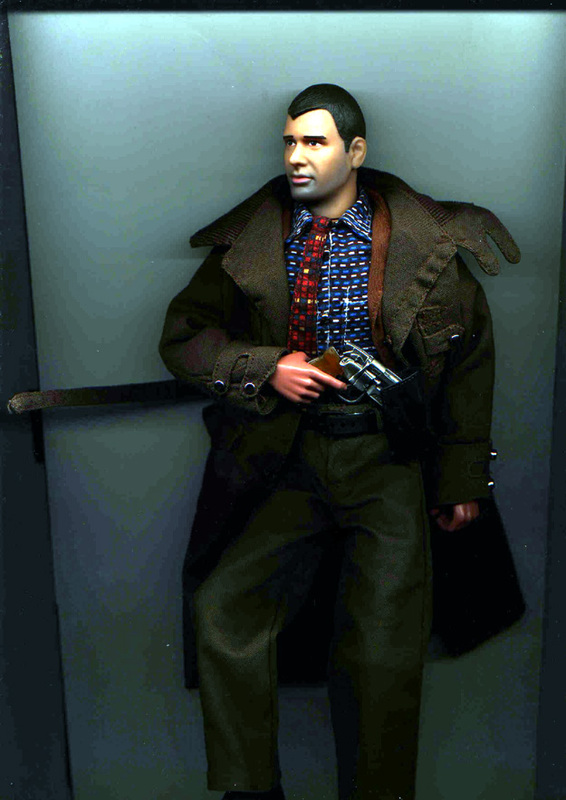 This figure, as you’ll be able to tell, is based on Harrison Ford’s character from Blade Runner and features a great sculpt – well worth checking out for fans of the movie or even just Ford. If you’re interested in ordering one of these figures (and can afford it! ), go direct to the item page by clicking here. There’s a painted sample of the unproduced holographic Queen Amidala figure up for sale now on eBay – search for item number 562208358. Saesee and Amidala (Theed) OUT NOW! Sae Sae Tinn and Amidala (Theed) have been found in several Wal-marts in NV. This has been confirmed as well. They are showing up on .01 and .03 card backs. Thanks to XFL Man for the news. Need a Marmit Fett still? Sandtroopers.com are giving away a set of R2-D2 with holo Leia, Darth Vader and Stormtrooper commtech figures, complete with Star Cases, sponsored by George Collazo. If you’ve not had any luck finding these cool figures, head over and enter! The Links and Collecting Club sections have been updated. If anyone has a new link or club they would like me to add please e-mail me. It looks like the enegy scare still lingers out west. Good luck guys hope everything gets back to normal soon. Yak-er FFuzz gave us a holler that he found the new spring SW Hallmark ornament today. It’s the second of the mini lunchbox series, but this time out it comes with a thermos too. This one depicts that great Empire lunchbox we all carried proudly to school way back when. These are great little pieces and bring back those childhood memories. Thanks to FFuzz for the heads up. Obi-Wan (Jedi Knight), Obi-Wan (Jedi), Darth Maul (Final Duel), Qui-Gon (Moisture Farmer), Anakin (Mechanic), R2-D2 (Naboo Escape) and Dagobah Darth Vader. They also have, for £10, the Sith Speeder TIGER game with the exclusive Darth Maul. A lot of the POTJ figures are backordered just now, but will come back in soon I expect. Thanks go to Philip Ayres for the info! Nice to see some POTJ stuff getting over to the UK, especially something like Dagobah Vader which many people are still looking for. ACPin has posted his complete Sith Lord Arrival diorama on his website – check it out! 300th Boba Fett: No more delays. We are now filling orders placed from April through August of 2000 for the 300th Star Wars Figure – Boba Fett (Item# 84566, $14.99). This item was originally scheduled for a November 2000 release, but was pushed back until spring 2001. To our surprise, in late December 2000, these items appeared at select mass retailers in the United States without our knowledge. After working with the kind folks at Hasbro and explaining that collectors couldn˜t wait any longer for these items, we were able to secure a relatively large quantity (thousands). Unfortunately, it is not enough to fill our huge backorder at this time. Hasbro is promoting this item at Toy Fair as being a key item for this spring. It remains on the price list and will ship in greater quantities soon. Check your account to see if yours is on the way! In case you did not see it…. Star Wars.com has posted the new George Lucas Select image. Check it out. If you want to see it without the filter that has been applied to it, stop by Collect Star Wars and check out the corrected image. Chris, who was kind enough to e-mail me photos of his custom playsets, for the soon to be revamped customs section, is selling his Neimodian Trade Ship on eBay. Chris’ work has an uncanny resemblance to the playsets of the vintage line, which so many of us have asked Hasbro to incorporate in their current creations. For those of you who would like to submit your custom work for the customs section, it’s not too late. Just drop me an e-mail with your images attached in a .zip file. Thanks to Colgate who sent this in….. It seems POTJ figures may be ready to hit Canada. Mark L wrote in to let us know that his local Wal Mart had done some rearranging and there was a section covered with a sheet labelled “SW Collection”. Possibly – not definitely! – POTJ figures. Mark said he’d write again after his weekend visit so we’ll update you then if not sooner. Update: Sooner than I thought…POTJ is out in Canada. NomadScout wrote in to say that NiubNiub’s Universe has some info, and POTNS has some too. D & S Toys have a few sets of the Plo Koon wave left, along with a few 12″ 100th Lukes and Bounty Hunters. If you need any of these items, head over to their site! This new E-Book is avaiable now Right Here from Peanut Press.com. The cost is a low low $1.99. If you are into E-Books, head on over and get it. We all know that The Official Fan Club was sold to Wizards, now you can read all about the sale of the company Fantastic Media. Decipher Acquires FANtastic Media!, (Norfolk, VA, February 9, 2001) – Decipher Inc. announced today it has hired the entire staff and acquired the assets of FANtastic Media. Click on the link to read the entire story…. Here are the latest updates from the Official Site, head on over if you wish to read the articles…. **The Academy of Motion Pictures Arts and Sciences has honored the talented artists at Lucas Digital with two Oscar nominations. **The Star Wars Fan Film Network has recently updated its marquee of fan-made films. **LucasArts has teamed up with PlayStation @ Metreon in San Francisco to premiere Star Wars Starfighter. **Classic Moments take you back in time for a fresh look at Episodes IV – VI. Today’s moment is Vader Breath. **Episode 1 Snapshot: In today’s snapshot, Ian McDiarmid emerges out of the blue. Many are asking this question lately about the Han Bespin and Plo Koon waves. Not many have been found at the retail level. I, myself have only seen the Han wave twice in my area and have yet to see the Plo wave anywhere. I have some friends that found Plo wave at Target and KMart but those stores usually get a case or two in, at the most. 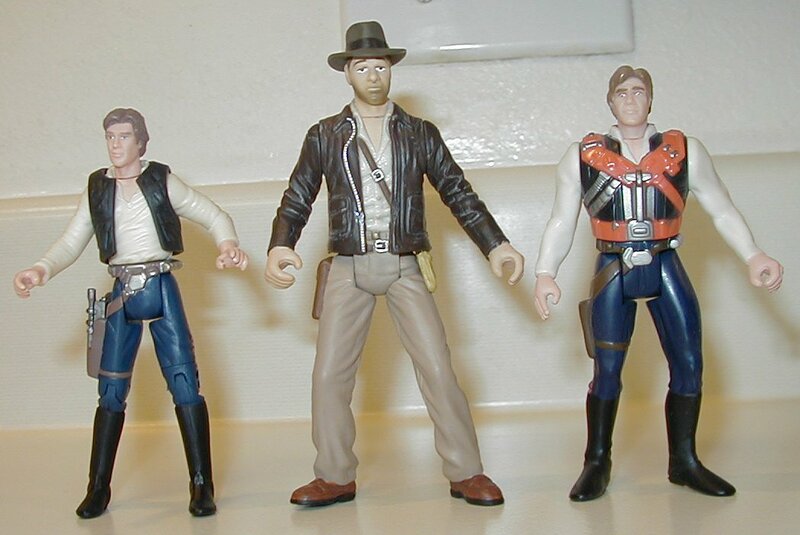 I had spotted the Han wave at two area Walmarts but that was a while ago now, and since haven’t seen them again. I have heard through two sources now that these cases have been sold out by Hasbro. So any retailers that have orders in will get them but none can reorder these cases. I also hear that some of these figs might be tucked into future cases but that is kinda of leary to believe. Hasbro seems to be knocking figs out of assts much earlier these days. If anyone can help confirm about these cases being sold out, gimmie a holler here. Though I can say that one source that told me this is pretty reliable with his info. Now get out there and hunt’em down guys…. Check out the picture of the closed-handed POTJ IG-88 variant on our IG-88 page in the toyguide. Well I am gonna help clear some air on the set. First off… I’ll help answer the questions. There are so many major differences in the sets. The first (dk purple) set is extremely purple in color. The whiskers, nose, ears and arms are very, very purple. There is a design on the arms, much like the 12” Jar Jar, that can hardly be seen on the dk set at all. The revised set has a much more yellow-ish (Gungan flesh) color look. This was one of the big factors in the change, besides him looking so ridiculous. If you can’t tell take a good look at the boxed version we have up then click the dk version link. You can clearly see the difference upon further inspection. OK… Second… I talked with my source that I bougt the set from way back in Sept and he was pretty sure that not many if any might have been shipped this way. Hasbro rejected the piece and he was sure they ordered for them to be destroyed. This also brings up why the set was postponed so long… This same scenario happened a while back on the FAO Leia/R2 set. Originally the Leia had a different head sculpt then the released version, that Hasbro thought was too Disney looking and they had those destroyed. I also own this piece and can say it is a huge difference, and actually better looking than the released set. So in essence if you do have this set consider yourself lucky. I do ask you to look carefully though at the above descriptions and pics. Thanks to blockhead for that report. We already know about the MOTDS set, but if you can find Bounty Hunters for $5 then that’s pretty cool! We have received many reports that the Theed Amidala and Sae Sae Tin are out. After checking out EBAY for these, there are plenty avaiable. So be on the lookout, as these appear to be shipping now. Do not give into the darkside, stay away from EBAY for these, they will be in stores soon. On another note, while in NYC for Toyfair, Ben and I did some shopping. We stopped at FAO, nothing there but overpriced Star Wars toys. They did have some VERY cool displays, look for those tomorrow. And we stopped into the Manhattan TRU on Broadway. If you are wondering where the Sith Lords 12″ 2-packs are. They are all on their shelves. Must have been about 50 of them (that is not an exaggeration). There were 2 shelves full. 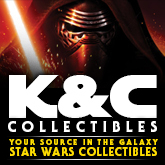 SWkids.com has updated with a new featured figure this week. This time it is Jar-Jar Tatooine. Well as promised ages ago…. I have some pics up of the first and unreleased 12″ Captain Tarpals and Kaadu set. I got my hands on this set in Sept of last year and knew it wouldn’t hit shelves looking this way. As you can see Mr Tarpals fell into a purple paint bath. This was of course rejected by Hasbro and most as I understand were destroyed. I am curious though if any slipped by and got shipped accidentally. For those finding these sets on Target shelves now, if you nab one this color please gimmie a holler here. I hope you enjoy a the pics and please forgive me for being soooo late on these. And now herethey are…. If you never bought a Commtech Reader, now would be a good time. Indalecio found plenty priced at 50 cents at a Wal Mart store in Laredo, TX. Hasbro reps indicated that more 300th Boba Fetts are on the way to retailers. So if you haven’t found one yet, take heart. As with any current figure, don’t give in to eBay!!! As illustrated with the R2-D2 with Holo Leia (which Mark here at Yakface predicted) all figures eventually become available at retail. Buying from scalpers only makes future releases more difficult to find. Don’t support the scalping industry. I’d like to thank Andy and Paul from Hasbro once again for their incredible hospitality at this years toy fair! Yakface.com is happy to bring you the latest news from Toyfair 2001. Click on the link above and check out all the latest images. Yakface.com is bringing you on a virtual tour of the show. Remember to check out all the links in the interior pages. Especially the comparison shots on the Chewbacca page and the secret about Ketwol. If you have any comments, send them to me. I hope you enjoy the images….. The ‘Collector’s world fairs’ SCI-FI fair on @ Basildon sports centre, Essex (Just up the A13 from Lakeside shopping centre) is tomorrow, Sunday 11th Feb. For full details, check out http://www.scifishows.com/basildon.htm. aswell as plenty of Star Wars from Startoys & Collectables among other dealers. If you’re after the 12″ Bounty Hunters, D&S toys and M & M collectibles both have them in stock, check out our newsfeeds section (button on the left) for more info. M & M also have the 2 exclusive Death Star board game figures in stock for $5.99, and D&S are expecting the Aurra Sing wave next week. So if you are in the UK I would definetly check Bothan out. I have never dealt with them but I have heard they are great to deal with. Some may remember a few months back I posted about some incredible and very limited statues that were being produced by a French company called Attakus. Well these statues are now shipping and I hear they are worth every dollar. Yak-er and huge Yoda fan Arn wrote in mentioning he received his a few days ago. Arn posted some pics and cool review at his all Yoda site, Yodafans.net. Head over and check it out, definetly worth it if you are interested in these statues at all. Click on the links below to see some very nice clean images. Loose Sae Sae Tin and a NEW carded image as well. The carded image was provided thanks to New Force Comicsand Amanamatt. UPDATE:The Trade Federation also has some great loose images of both Sae Sae and the Queen. Check those out at the link above. 3x Darth Maul Crusade – Fully exposed with no shirt. 1x Darth Maul Crusade – Fully Exposed. 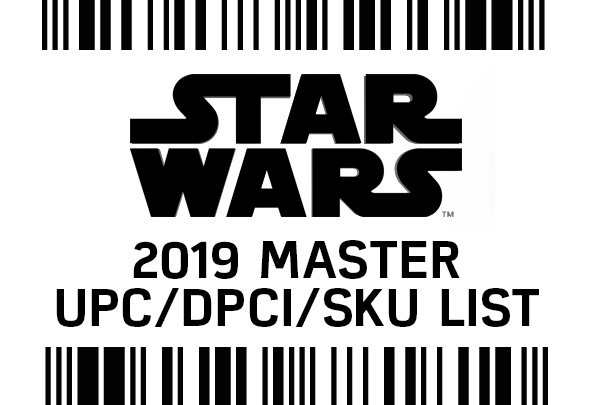 You get to help pick the next Ultarama Background, Rebelscum will be running a poll the same time Toy Fair runs in New York. 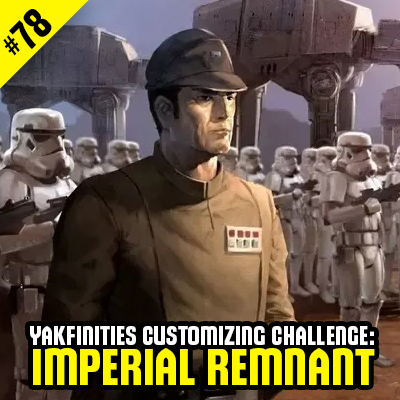 Rebelscum.com and you get to pick the next Ultarama background. You can get a preview of the six photos to choose from on rebelscums Ultarama page, but the poll doesn’t start until this Sunday. head over there this week and vote. Also make sure you check back here daily as Yakface.com will be bringing you updates from Toyfair 2001 this weekend. As the post below says, the deluxe figures are scheduled for a late fall release. As such, the shipping information KEBco received which we posted yesterday must have been incorrect. This is no fault of the company, they were given an incorrect shipping date for their order. Sorry about any confusion. Fan`s Favorite Fig. Ast. 1 (Item# 84475A, $69.99) and Fan`s Favorite Fig. Ast. 2 (Item# 84475B, $69.99)are the most anticipated new Star Wars products of the year, scheduled for a Fall release. These new deluxe action figures feature Leia with Sail Barge Cannon, Fan’s Choice Action Figure #2 – Amanaman with Salacious Crumb, Luke with Bacta Tank, harness and breather mask, Darth Maul Crusade – Fully exposed with no shirt. (Subject to Change.) Reserve your case today at Entertainment Earth. Has that beat up old wagon broke down for good? For those that haven’t seen this awesome display system in person yet, here’s your chance. I highly recommend these displays, great all around piece. You can also check them out by hitting the link above. Tell’em Sidster send ya. “We just got word from Hasbro that we will be receiving eight cases (48 pieces) of the new Star Wars Deluxe figures. They are scheduled to be shipped from Hasbro on February 7th, which means we should have them by the 14th. This is the Luke Skywalker in Bacta Tank and Princess Leia with Cannon. At this time, we do not know how the assortment will be. All 48 pieces may be the Luke, it may be a mixture of Luke and Leia??? Just do not know. But we do know we are getting only 48 pieces at this time. So, if you want to be sure to get one, act NOW. We do have these listed on our pre-order page. The price is $9.99 each. You can go to www.kebcotoys.com and order one from our pre-order page. Check out THIS LINK!! 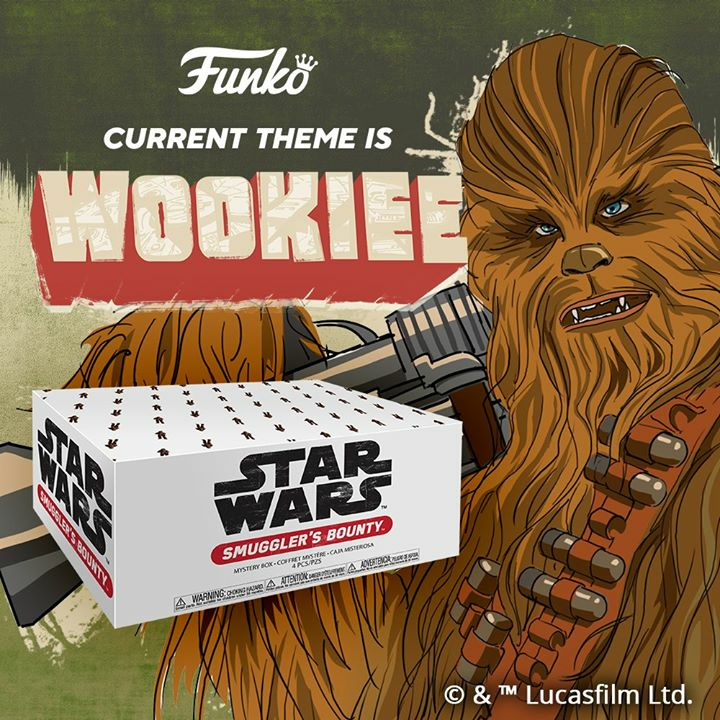 !, as Starwars.com has updated with all new images that include…. 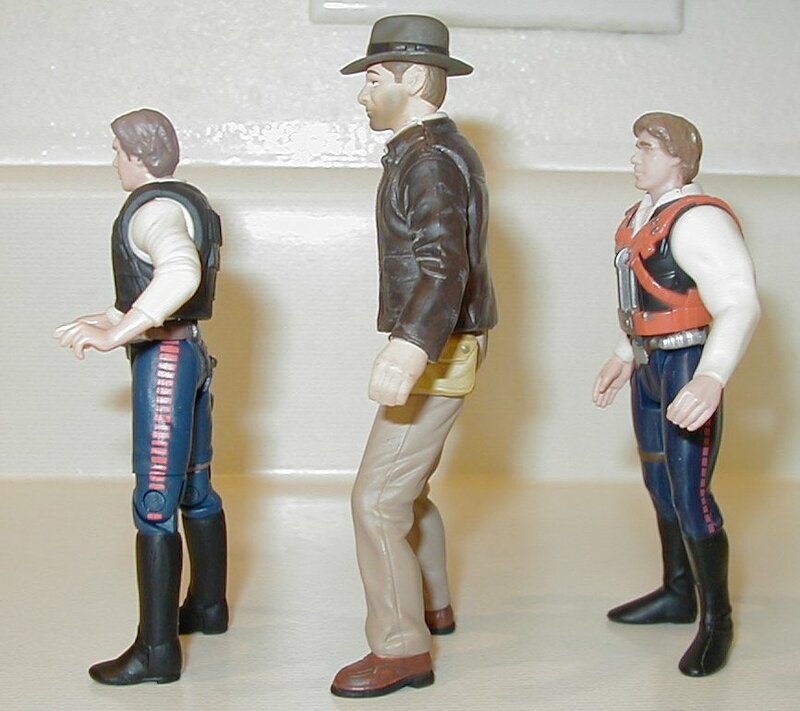 Here are a few comparison shots of the new Indiana Jones figure loose with a few SW figures. Thanks to Mark for the images. is an item that was introduced last year, but never shipped. It now has a new name and a new ship date. This item was previously called the Palm Talkers Assortment. 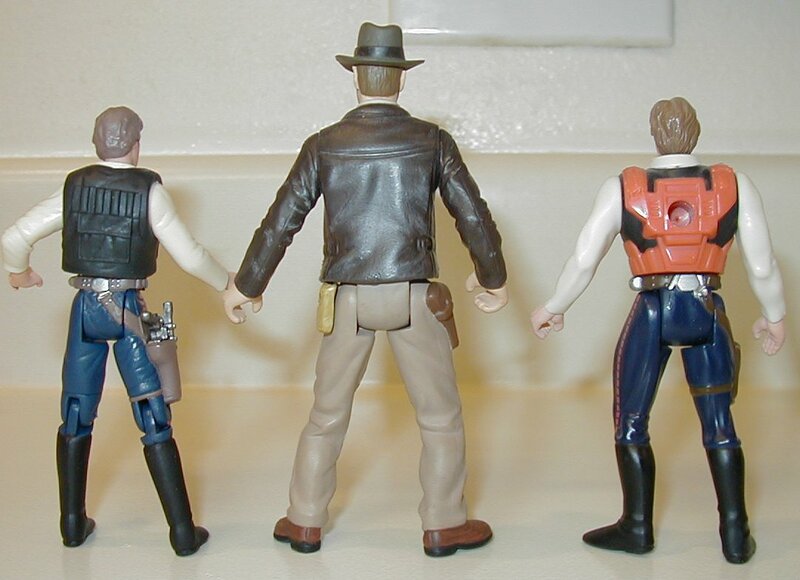 This assortment was reduced from 12 figures to 8. The price has also been reduced from $124.99 to $89.99. We will update all backorders with the new price. Only at Entertainment Earth. So, Target got ’em first? If you find them at stores other than Target, let us know. We try to encourage collectors to share their finds by reporting finds along with specific store locations in our forums. We tend to only post a couple of sightings on the main news page just after an item is released to let you all know they’re out there. After that, we suggest you make good use of the store reports section of the forum to post and ask where you can find these. There’s a link to the forums at the right as well as in every post header. Thanks! Thanks to Thomas for the images. Check out the new image of Tessek, Click on the image to see the full shot. Once again Star Wars Kids has come through with a great image. REAL SCAN EP II PICS!! The Official SW site has updated with incredible pictures of busts of characters from Ep II that were scanned using the Real Scan technology. These will be on display at the Toy Fair in NYC next week. Hi, I’m actor Troy McClure. You might remember me from such science fiction websites as… I mean hey guys – Rich here. You guys may remember me from back in the day when Yakface’s Realm was a fledgling site. Well, I’m baaaack. So here’s the deal I’m going to get the Figures In Action section running once again with some new scenes on the way (SOTE and ROTJ sections coming online shortly). My other baby is going to be refurbishing the customs section. I need you guys to submit your custom images. I’m talking figures, playsets, weapons, decals, 12-inch, 1-inch, whatever. You name it I want it. With your help, I’m going to create the most comprehensive customs gallery on the net. So be sure to e-mail me your images. Thanks to Joe for the following news. Sounds like the new Fan Club is starting to move forward. Star Wars 12inch Legacy Asst.2 (Item# 32406A, $139.99), The only 12inch Star Wars figures scheduled for 2001, has been updated with a new case breakdown. This item will now include 2x Han Solo in Stormtrooper Disguise, 2x Death Star Trooper, 2x Death Star Droid (subject to change.) Available for preorder at Entertainment Earth. 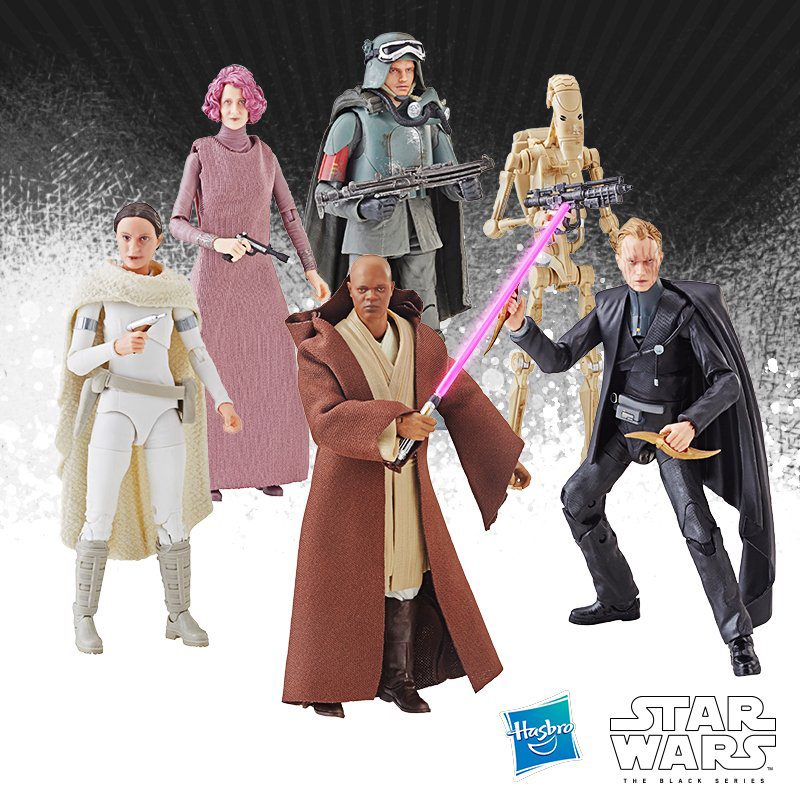 They showed up at Wal Mart earlier this week, and now Target have the Plo Koon wave. Carl Harley reports finding them for $4.05 at a Las Vegas Target store. “We just went through and did an inventory today and found several items that we only have 1 or 2 of left in stock. So, to move these items out, we have reduced the prices appox. 50% on them and put them into our Sale Items Section. Here we go…Atlanta. LooseToon found the 12″ Kaadu in Snellville, Georgia, a suburb of Atlanta. Click here for a scan of the receipt. And before anyone starts 🙂 the other two are for friends. Well if you are interested in readin the opening scrawl for Episode II, then simply click on the link HERE, it will bring you to the very nicely made Flash version of it from The Force.net. Here is a nice picture of the New 12″ Captain Tarpals w/ Kaadu. Thanks to T man for the image. I lost all mail from today. If you have sent me an email today, please resend it. Sorry for the inconvenience. With much work and effort…. We hope that you enjoy the new look here at Yakface.com, please take a moment and vote on the new poll while you are here, and if you have any comments, please email Mark…. Thanks to Bill Woods for the following news. This is the first I’ve heard of the Plo Koon wave showing up at Wal-mart. “Hi, just to let you know that the 12” Tarpals with Kaadu Target exclusive is shipping out. Our store is receiving 12 tomorrow. We at Yakface.com are doing all that we can to make you visit here at Yakface.com the best it can be. You will notice during the day tomorrow that most of the sections will not be available as we are making MINOR modifications to the site to speed it up for your viewing pleasure. You will still be able to get to the main page and interior pages like FBTB and Tusken Trader. Thank you for your support and patience. The Aurra Sing wave was out in full FORCE at FX 2001 Show in FL. Aurra was going for $15-20, Leia Bespin and Chewie Mechanic were $10-15. Most dealers at the show had 3-4 cases. Some had close to 10 cases of them. Thanks to Bobby D for the news. This is the first report of the Aurra Sing wave showing up in the US, still no reports of them in actual stores though. Sounds very possible to me – Feb 15th sounds like a good time to start the Kaadu hunt (unless you’re lucky enough to have already found one). OK, another update. I’ve been hearing some nasty stuff. Some people who’d ordered things from the company in the past had discovered fresh charges on their credit cards for no reason at all. Add that to the usual pile of people who had preordered a lot of POTJ merchandise and paid a 25% deposit only to receive just a few items or even nothing at all, and we have a large database of complaints. Right now, I’d advise anyone who has been charged money either for no reason, or for items they never got, to file complaints with their credit card company. Seems not all stores are doing the POTJ 2 for 1 offer I mentioned yesterday. If you have bought stuff recently from a K-Mart, at full price, and the store is now offering 2 for 1, take your receipt and see if you can claim the difference back. But, not all stores are doing the deal, at least not yet. Donald from Wisconsin Milwaukee wrote in to say that the 12″ Kaadu and Tarpals are in the Target warehouse and they don’t know why they’re not hitting everywhere yet (presumably he was told this by a Target employee). If that is the case, Target may be waiting for a certain street date. If anyone knows if this is the case, and knows the date, please send it in. U.S. and Canada February 21, 2001. Also a special offer – if you order the game through Lucasarts’ Company Store you get free shipping plus a special hint guide for mission 1. Collectstarwars.com has a short interview w Andy from Hasbro on their site. There is some info on the upcoming Luke X-Wing and several other details. WOW is all I can say on this one. Man does it look nice. Here is the new Lando Bespin Image. The image was found onThe Star Wars Kids site. Thanks to Chris B for the news. TO check out the movie, go to www.ohair.net/hyperspace/survivor. Oh dear. Since my post earlier today, I’ve received even more complaints, plus a number of people who live in or have passed by the Atlanta GA area have mentioned that the company’s retail store there appears to have closed. Some have heard the company were declared bankrupt. Hamlet recommends that those who have been ripped off do as he has done and contact the Better Business Bureau to report it. Thanks to everyone who wrote in about this. If you’re a Simpsons fan, there’s a great custom figure for you on sale on eBay – check out item number 551674274 for a custom Homer Simpson as a Stormtrooper figure! Update: Check out item #550007708 for a SWEET Chewbacca Homer! Expect the 12″ Kaadu to become more widespread in the near future. It’s due out in Japan on the 9th Feb. They usually get things earlier than the States do but for some reason, the Target stores nearest their distribution center got a crack at them early. Watch out for them to hit all Targets soon. Well to anyone looking to talk anything Star Wars at all, join me over at Sandtroopers.com Chat room on Sat the 3rd at 8 pm (est). The troops invited me over to join in and talk with all of our readers. They have done a great job over atSandtroopers in the short while they’ve been around. Thanks to Pat and his awesome crew for the invite, meet me there guys this Sat. Yup it’s true, them little desert wanderer’s have another bunch of free goodies to give away. Head over to Jawa.com and enter to win a TC-14 fig for absolutely NADA… Oh wait… They are also having a “promotional” give away to celebrate the Grand Opening of their new trading forum, “The Jawa Swap Meet”. 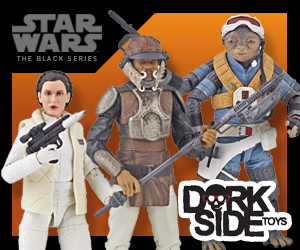 They’re giving away four brand new POTJ figs, IG-88, Plo Koon, K-3PO, and Mon Calamari Officer. This contest is to promote our their section, and gain members. Hey if four free figs isn’t reason enough, what is? Howdy to all out there wondering just that question…. I just started a new job which I need lots of training on, I’m in a new field and I’m starting from scratch. Time is not something I seem to have enough of lately at all…. I’ll be here, but just not as much during the weekdays. I have to study hard and hopefully pass the test I need to in three weeks. 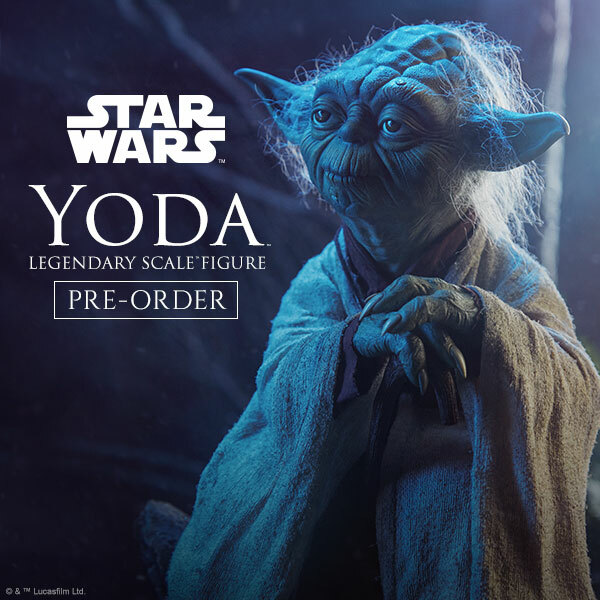 “We have a limited number of new Star Wars Figures in stock on our website right now….